Beginning with the consideration of how day to day work can be made easier for users of Vision laser systems, progressing to the question of how we can provide the best possible service and self-help to our customers around the world within the shortest time, 7 days a week, 24 hours a day, the “Smart Factory ready” project has become a complex production control. 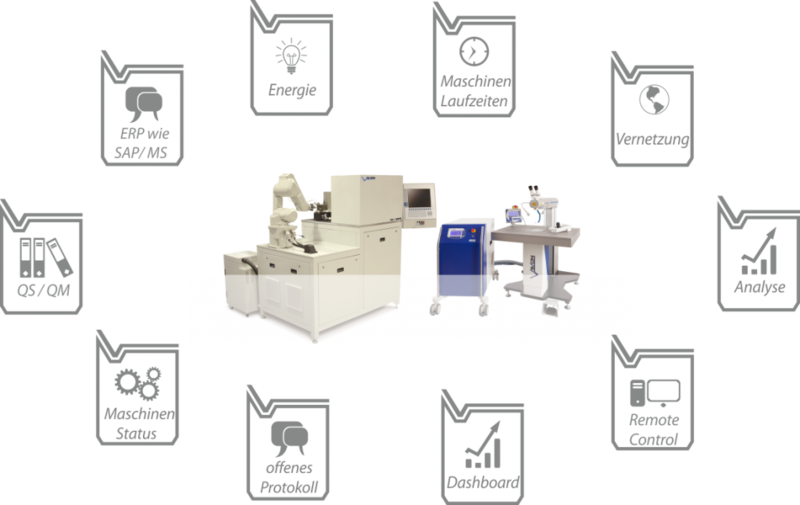 Vision Lasertechnik’s laser systems are optionally equipped with a smart extension which allows the device to be networked with a central Vision management software. Using this it is not only possible to efficiently manage production and report on manufacturing processes in compliance with QM – outstanding reporting on historical information, live data and forecast developments is implemented through the integration of a Vision CEP platform and big data analysis. Through additionally available “smart connectors”, our customers do not only connect machines and systems from Vision Lasertechnik – universal hardware also allows older machines from other manufacturers and “non-smart devices” to be connected. 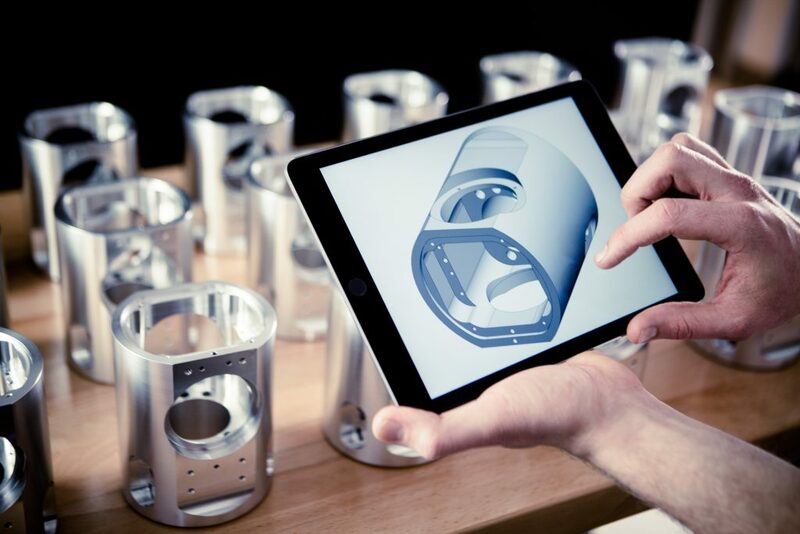 Since the beginning of the 2010s, European industry has begun implementation of the Industry 4.0 project. Alongside the efficient production of small batches, the clearly identifiable products, the fully traceable manufacturing steps and the vertically embedded production systems in business processes, the “Smart Factory” area is an important part of the revolution supported and demanded by the German government and industry. “Smart Factory ready” is the main area of development for the working group established by Vision Lasertechnik GmbH – with the aim of making Vision Lasertechnik GmbH’s systems networkable, monitorable and more efficient. The stand-alone solutions which, until now, had largely been working independently became components in an integrated network – with the resulting benefits with regard to efficiency, service, availability and reliability. Also the new technologies are substantially based of the tried and tested technology of recent years. This has been proved thousands of times around the world. Additional hardware and software components resulted partially based on the project with our customers and were extensively tested in a harsh industrial environment. Only thus is the efficient integration of our systems into the manufacturing process possible. Each Vision Lasertechnik system controls its own task perfectly, i. e. welding or marking − until now there was no networking or connection between the individual products at all. Status determination by external IT departments, documentation for QM or efficiency monitoring were not even possible. each island continues to be able to function independently and has grown to the full extent of its tasks. In connection with the Vision server, radial satellite networking occurs without forming a direct connection between the individual devices. This network structure allows for continuous data transfer in real time. New devices can be added to the network without a problem and connect “Plug-and-Produce” to the system. Owing to the large number of Vision systems in Germany and around the world, we have a great demand for our devices’ compatibility with the new “Smart Factory ready” technologies. All LWI IV and LWI V generation devices can be upgraded, existing sequential and parameter programs can be imported into the new software without a problem. This also offers the benefit that even old programs in different programming languages will be able to be maintained by existing personnel in the future. Customer-specific connection of other companies’ systems is generally also possible owing to the open interface. Two technologies, separated from one another, allow our customers to choose whether a global connection across multiple locations/countries/continents is desired or whether internal networking is required. We offer the greatest possible degree of security for both variants. It is apparent to the customers at all times which files are exchanged with which recipients/senders, external access is only possible with authorisation (general or temporary). We place great value on transparency and security – key elements of Industry 4.0 and in particular the “Internet of things”.